Taken from Preludes & Nocturnes, one of my favourite moments. Time for some fun with everyone's favorite personification of Death! Filling a request by leikomgwtfbbq for some Sandman, specifically, the story of His Imperial Majesty, Emperor Norton I, with a guest appearance by Mark Twain. 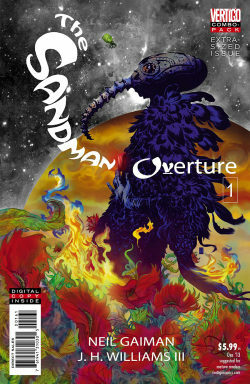 8/24 pages from Sandman issue #31. In our last chapter, Hector was subjected to bodysnatching, psychic intervention, ancient wizard dickery, and finally found a long lost someone. In this chapter, we get two reunions, a fight, and a lot of history hopscotching between DC and Vertigo. Twenty-five pages from six issues, spread out over JSA, Infinity Inc., and Sandman. 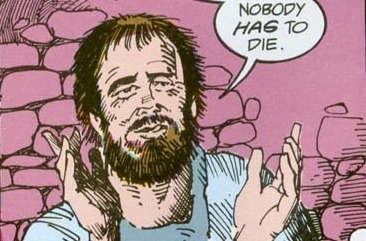 Also features the second-creepiest panel of Hector ever. After the events of Gaiman's Sandman, it's revealed in JSA Secret Files and Origins that Wesley Dodds, the man who fought crime under the name Sandman in the 40s, still retains the "gift" of prophetic dreams that he gained in his encounter with Morpheus. And so our story begins with a death, a murder, and a reincarnation. Thirty two total pages from Secret Files, and JSA #1-4. So very not dialup friendly.